PA(7) is back in stock and we have a very special promotion just for you! 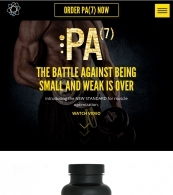 PA(7) has been clinically proven in peer-reviewed, placebo-controlled human trials to double muscle growth, double fat loss, and increase bench press by 64% and squat by 32.5%. We want you to get the exact same type of gains--but there's more. We are also including our famous MGS or Muscle Growth System workout plan and a FREE 100 servings tub of C(2) Creapure Creatine - ALL FOR FREE! All said and done, you get two bottles of PA(7) and One tub of C(2). This is a $140 value all for only $104.98! Take advantage while supplies last. Not Interested in this offer? © 2018 High Performance Nutrition Inc. All Rights Reserved.